Located in the busy, bustling Turnstile Market connected to the Columbus Circle subway station, Daa! Dumplings mingles with stores like Lush and Papyrus as well as other New York fave food spots like Chick’n Cone and Pressed Juicery. But despite walking past the dozen or so other choices for dinner, my guest and I couldn’t get over the tantalizing smell coming from behind the Daa! Dumplings counter. The menu is as straightforward as can be — if you’re familiar with Russian dumplings. The dumplings, formally called Pelmeni, come in cabbage, potato, beef, pork, veal, chicken and shredded beef and pork flavors and are steamed and brushed with butter. 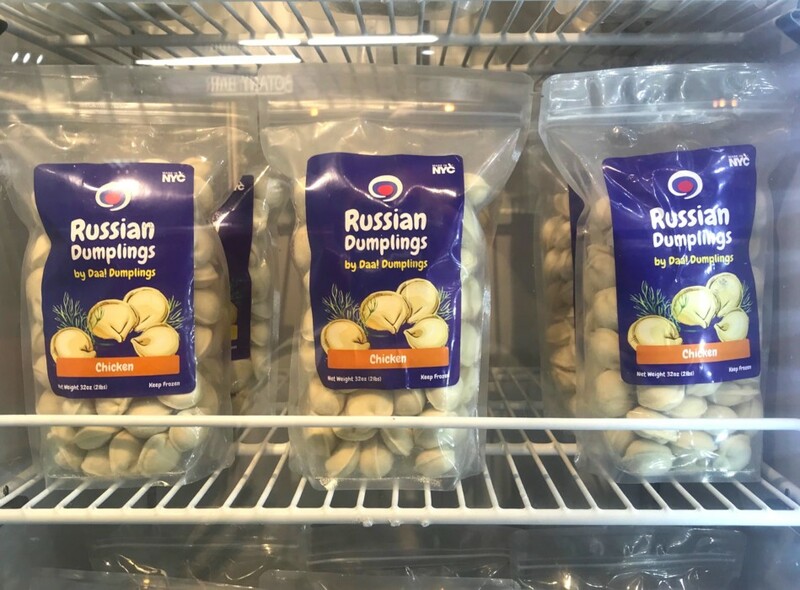 For $8.75, you can get the “snack” portion of Pelmeni, which comes with twelve dumplings, a pickle and sour cream. (Don’t worry — the dumplings are smaller, so you won’t be stuffed by having the snack.) For just a bit more ($12.75), you can get eighteen dumplings. Also to note on the menu is the Russian soda called Kvas ($3). Our host told us the drink, which is widely popular in Russia, tastes like a mix between kombucha and root beer. Obviously, my guest and I were intrigued and wanted to try a bottle. We also decided to sample multiple dumplings, so we ordered the cabbage, potato, beef and pork flavors. Within moments, everything came out piping hot (and the drink ice cold), and we dug right in. The cabbage dumplings reminded me personally of my Pennsylvania Dutch roots — my mother used to make cabbage in much the same way as the cabbage in the dumpling. The potato dumplings were pillowy and buttery while the beef and pork dumplings were juicy. We also got to order some extra sauces beyond sour cream. (The establishment offers sweet pepper, mustard mayo and Adjika tomato dipping sauces, which all worked well with the dumplings.) The drink was, in our opinion, a mix between root beer and regular beer, and we could taste the hops. We’d definitely drink it again! While the New York Times article on Daa! Dumplings certainly shined some light on how great the restaurant really is, we have to say that they put their focus in the wrong place. While they gushed about another menu item, the Georgian Khinkali (larger dumplings originating in — yep — Georgia), our host stressed that the specialty was the Pelmeni dumpling. After trying them for myself, I can agree wholeheartedly. While we bet everything on the menu is holy-what-have-I-been-missing-all-my-life good, I walked away that night dreaming of the Pelmeni, and how I was certain I’d be back for more.